be more realistic about a situation, no matter how unpleasant it is. This is an informal idiom. It's often used as a command to persuade someone to pay attention to something important—but it could be rude to say this someone you don't know well or to an authority figure, superior at work, etc. You failed algebra? Wake up and smell the coffee or you're not going to graduate with your class in June. It wasn't until I was fired for being late to my job that I finally woke up and smelled the coffee. Before I went to law school, I'd tried to get acting jobs for five years. I finally had to wake up and smell the coffee that I wasn't going to become a professional actor. Parents need to wake up and smell the coffee and educate their children about the dangers of everyday drugs like cough syrup and inhalants. A crisis can sometimes be helpful if people are forced to wake up and smell the coffee and make changes in their lives. Wake up and smell the coffee! Your husband's hit you twice and it will happen again and again if you stay with him. The cash drawer is missing $75 again. We have to wake up and smell the coffee that one of our employees is stealing from the company. Having a heart attack is that “good" way to get people to wake up and smell the coffee about their health. If my son doesn't wake up and smell the coffee soon he'll be evicted from his apartment. I was a workaholic and didn't wake up and smell the coffee until my wife said she wanted to get a divorce. You haven't finished your essay yet? Wake up and smell the coffee or you're not going to get into college. 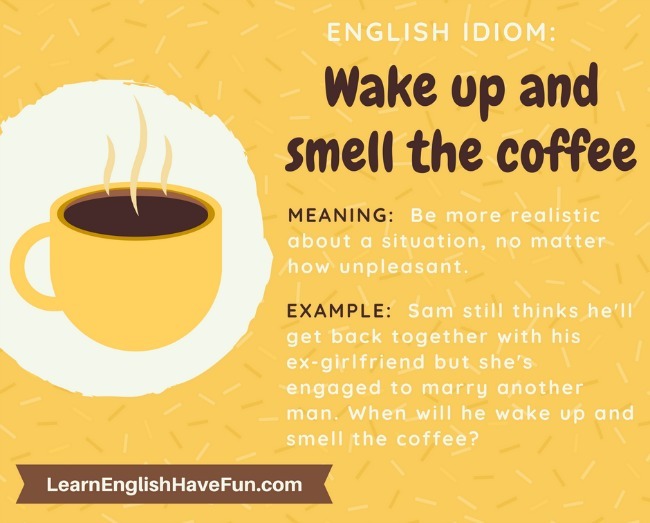 Your turn to use "wake up and smell the coffee"